I know it seems kind of early (at least, I hope it does!) to be thinking about the holidays, but Crochet Today is on top of it as far as actually giving you the patterns in time to make things for THIS year’s holidays. 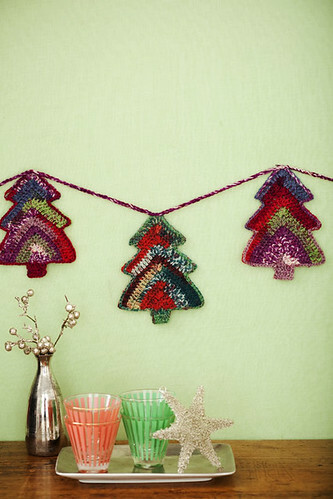 One of my patterns in the Nov/Dec 2010 issue is this easy tree garland. Each tree is crocheted individually, all in one piece, and then they are strung on a crocheted chain. You can attach the trees “as you go” so that you don’t have to sew them all together at the end. I love the construction of each tree- I started them with a magic ring at the bottom (no foundation chain!) and worked towards the top in a mitered pattern that emphasizes the triangular shapes. Once all three tiers are made, you work the trunk in conjunction with the edging, leaving you only 2 ends to weave in for each tree. These are a great way to use up the little bits of sock yarn you have leftover from sock making, or of course you could make them in any scraps of yarn if you don’t care what size each tree is. Striped sock yarn adds an element of fun and motivation, though, because with each round you’ll see different colors taking shape. And if you’re lazy about putting up a real tree, like me, this garland takes up a lot less space! Check out my oldie-but-goodie posts on Craftstylish for other holiday/scrap ideas, including crocheted autumn leaves and simple holiday ornaments. I love those cute trees - is it for beginners like me? I think an "enthusiastic" beginner could do these, maybe with a little help. Give it a shot! The tree garland is so beautiful, Linda! Congratulations for the feature! Your trees are probably my favorite from the issue. :] But I love the V stitch Gloves too. Those are the only two that I know I defiantly want to make.